The classic Dunk Tank Attraction! 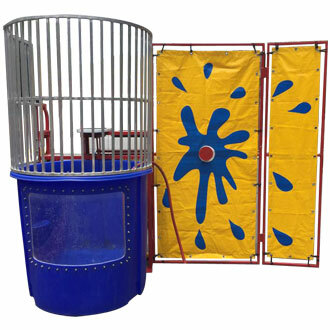 Description: Dunk tank rental with window display. Perfect for all types of events. Call today to reserve, Only $250/day rental. Ask about our weekday special, also special pricing when also renting an inflatable, call for more info and to book our new dunk tank for your next event. This dunk tank rental requires a 6ft wide clearance, but if it can't fit don't worry, check out our folding dunk tank. Our special price is for a delivery area within 20 miles of Paterson zip code 07524. We serve Wayne, Clifton, Paramus, Closter, Fort Lee, Hackensack and many more towns in New Jersey. Don't wait and book our Dunk tank rental today ! Follow us on Facebook and YouTube.